I’ll Fly Away – Wiley Oakley “The Roamin’ Man of the Mountains” – Wiley Oakley was born on September 12, 1885, in a small log cabin under the foot of Mt. 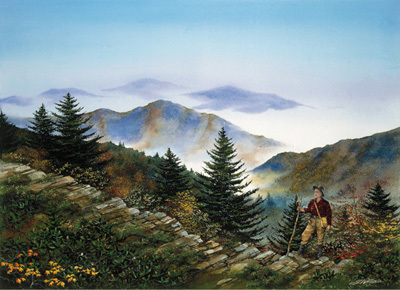 LeConte in what is now part of the Great Smoky Mountains National Park. All of the original watercolours listed here are found within this web site. Pricing includes Museum Matting and Framing. Original paintings may be purchased only by phone.